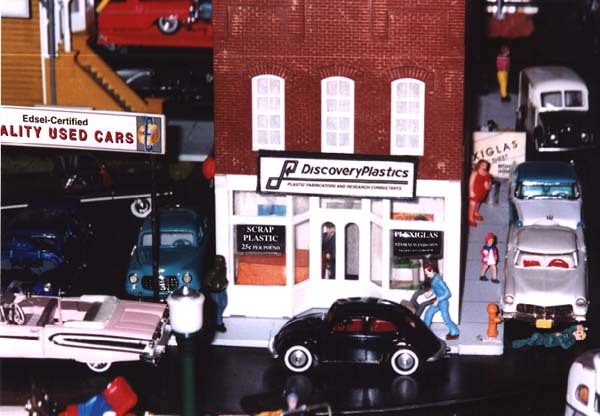 Discovery Plastics has a black Volkswagen parked out front and a Continental Mark II on the side - with a mechanic working under it. Behind it is a '56 blue and white Ford Fairlane, a mostly-hidden forklift carrying a 4'x8' sheet of masked Plexiglas and a Divco van from Dugan's Bakeries. The Edsel dealership's used car lot is on the left. More photos and information on Discovery Plastics are posted here. Side of Discovery Plastics weathered brick building is full of advertising. Ads like these, plastered on available wall space, were a common sight in the 1940s and 1950s. Pennsy yard switcher diesel descends below street level. 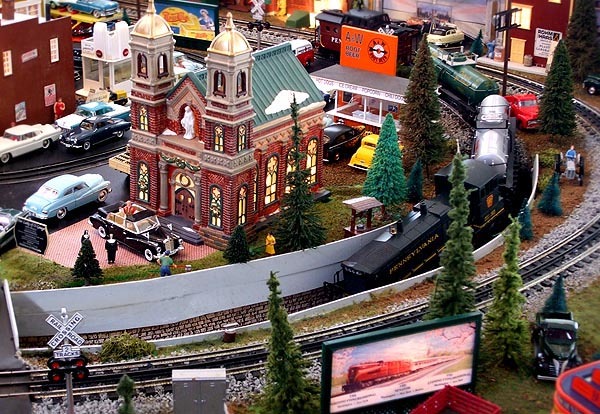 Our Lady of O-Gauge Church is on the left and A&W Root Beer stand is behind church. Note Pope John XXIII in Papal Mercedes limo in front of church. 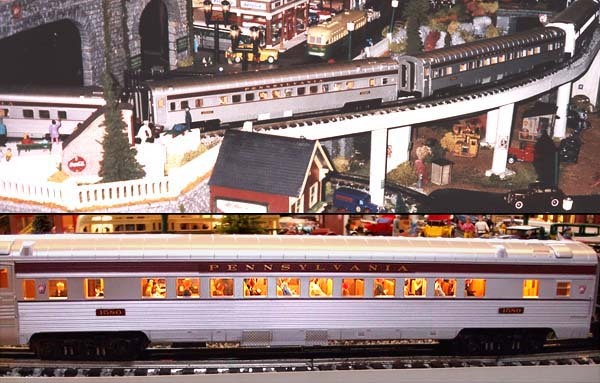 Lighted billboard advertises the Pennsy's Congressional Limited express passenger train. 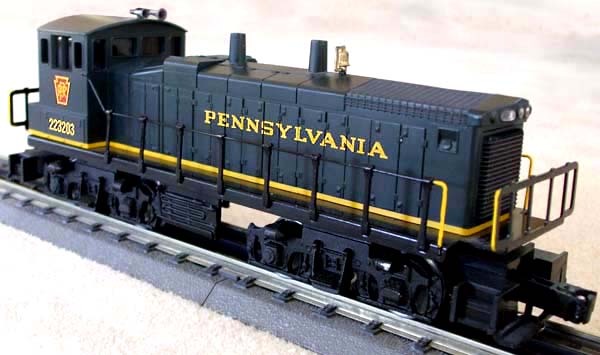 In 2006, I purchased a set of five MTH Congressional-style cars in ribbed silver with Tuscan stripe and 'Pennsylvania' in gold letters. These are pulled by the Tuscan GG1 locomotive. In the close-up photo, seated people can be seen through the coach windows. A gold SEPTA trolley also emerges from a tunnel and prepares to stop for passenger pickup. A white and green PTC GM 'fishbowl' bus can be seen at the right, near the PTC information booth. To see a giant, detailed enlargement of this photo, click here. Brill PTC trolley is seen on the lower level. 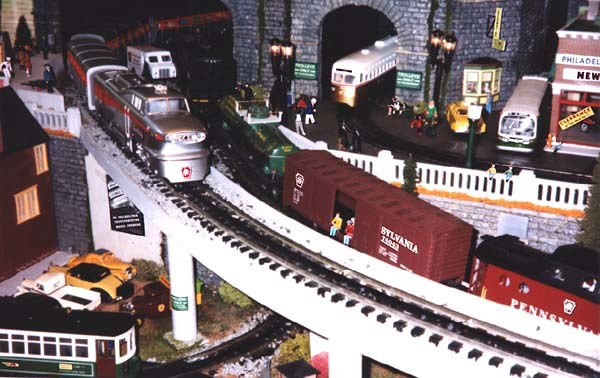 On the next level, the Pennsy Aerotrain emerges from the tunnel - making a station stop, while the ascending PRR freight consist, pulled by EMD diesel, enters the tunnel - squeezing past a PRR maintenance van.